These changes in the conception of neurodegenerative conditions have not deterred researchers at Tokyo Medical and Dental University (TMDU) to delve deep into the underlying mechanisms of these diseases. The researchers previously found the overexpression of YAPdeltaC, the neuronal isoform of the protein YAP which is involved in the regulation of gene expression, prevents transcriptional repression-induced atypical death (TRIAD) of neurons in Huntington's disease in vitro models. TRIAD is a distinct form of cell death; it is extremely slow in comparison with apoptosis, necrosis, or autophagy. 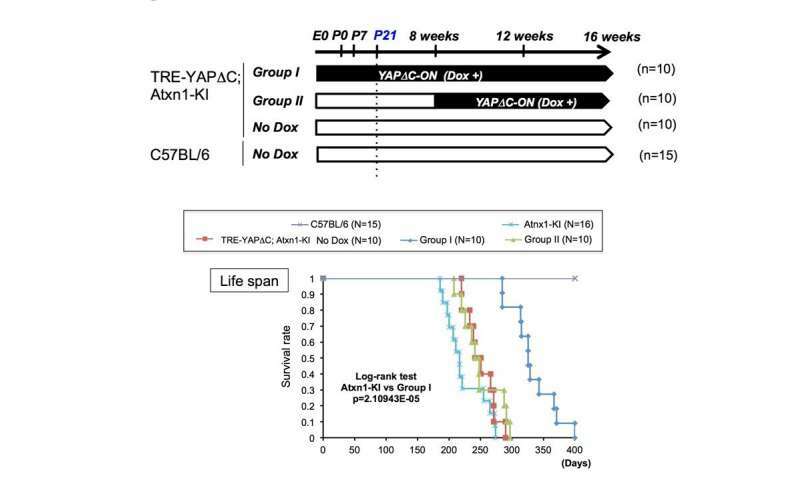 In a new study, the researchers further tested the therapeutic effect of YAPdeltaC - this time on SCA1 pathology in mice. They published their findings in Nature Communications. "Unexpectedly, adulthood expression of YAPdeltaC did not ameliorate the pathology andsymptoms of Atxn1-KI mice," study lead author Kyota Fujita explains. "Instead, YAPdeltaC expression during development markedly rescued the pathology and symptoms in adulthood." "Collectively, our results indicate that functional impairment of YAP/YAPdeltaC by mutant Atxn1 protein during development determines the adult pathology of SCA1," corresponding author Hitoshi Okazawa says. "We believe certain molecular signatures generated during development significantly influence late-onset phenotypes, and that these signatures act by restoring gene expression to optimal levels. Therefore, identification of these signature genes would enable us to manipulate the late-onset cell death of SCA1 - and even other neurodegenerative diseases - in the future."